Michael Smith during his debut for Northern Ireland against Slovenia. Peterborough United manager Graham Westley has warned the club’s international stars that they won’t necessarily walk straight back int his starting line-up. Michael Smith (Northern Ireland), Gaby Zakuani (DR Congo), Harry Toffolo (England Under 20s), Martin Samuelsen (Norway Under 21s) and Kgosi Ntlhe (South Africa Under 23s) all missed the Good Friday win over Coventry because of their call-ups. Posh full-back Michael Smith in action for Northern Ireland against Slovenia in Belfast. Westley was proud to see his players playing for their countries, but he will monitor fitness levels before deciding whether or not to change a winning side. “It was great to see Peterborough United with so many representatives on the international stage,” Westley said. “They should be back with us today (Thursday), or possibly Friday in Gaby’s case, but I can tell them now it will be tough to take a shirt from anyone who played against Coventry. Westley hasn’t named an unchanged starting line-up since January 16 and whoever plays on Saturday (April 2) will be told to treat struggling Crewe with plenty of respect at the ABAX Stadium. Crewe haven’t won any of their last 10 League One matches and are 11 points from safety and 21 points behind Posh. 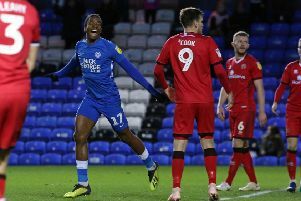 Posh delivered a scintillating display when winning 5-1 at Gresty Road in November. Westley added: “Looking at the league table there isn’t a lot on the rest of the season for us, but we are still learning and we want to continue that education in the remaining games. “We are quite simply just learning to win the next game. It’s a good habit to get into. “The teams we are playing against still have plenty to play for so we need to to show the same resolve and commitment as we did against Coventry in the second-half. We also need to start the game much better. “Crewe played well over Easter without picking up any points. They pushed an in-form Bradford side all the way on Monday. “They are only losing games by the odd goal so they will be a threat to us. “It’s a game they will probably feel they need to win so they will a danger to us if we are below our best. “I freshened our players up after the Coventry game by giving them three days off. “They deserved that. I don’t think they’ve had more than a single day off in a row since I’ve been at the club.